The Viking faithful will have some cheering to do, as Decorah will send three events to the boys’ state swim meet following regional competition at Linn-Mar Saturday. Decorah finished fourth in the team standings, scoring 200 points. Iowa City West took first with 443 points, while Cedar Rapids Washington took second with 385. With 339 points Linn-Mar rounded out the top-three. Events are qualified based on having the 24-fastest times across the state. There are no classes in swimming; all schools compete against one another. The state meet is Saturday, Feb. 9, on the University of Iowa campus in Iowa City in the Campus Recreation and Wellness Center (CRWC) beginning at 12:30 p.m.
“This was a very good meet and I am proud of all the boys,” said Coach Laura Storlie. Decorah qualified four athletes in a relay and one individual in two events. 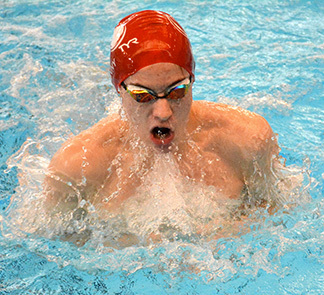 Returning to the big stage with state experience from a year ago is Gus Grimstad, who will be competing in two individual events, in addition to the 200-yard medley relay. Joining Grimstad on the voyage at state will be Jackson Penny, Bradyn Hook and Christian Johnson. As the day got underway, the Viking teammates Grimstad, Penny, Hook and Johnson stopped the clock in sixth place in the 200-yard medley relay. Their time of 1:42.22 squeezed them into the top-24 field in the final state-qualifying spot. Grimstad went on to finish runner-up in the 100-yard butterfly and 100-yard backstroke. The sophomore posted 100-yard butterfly split times of 24.85 and 28.02 to post a new school record of 52.87 seconds and punch a ticket to the state swim meet. Taking first was Izaak Hajek of Iowa City West in 50.57 (23.56, 27.01). Grimstad’s regional time gives him the eighth-best seed heading into state. Hajek has the fastest time. Later in the day, Grimstad touched the wall second again as he was in the water for the 100-yard backstroke in 53.76 (25.90, 27..86). Claiming the individual win was Linn-Mar junior Nick Cavanah in 51.39 (25.29, 26.10). The Decorah swimmer enters the state meet with a ninth seed while Cavanah holds the fastest time entering the state event.